Fire features continue to be a top homeowner request. 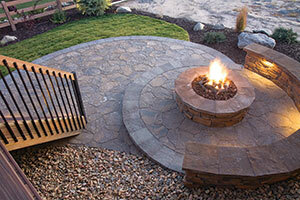 During the fall in particular, fire pits and fireplaces are in high demand. With autumn just around the corner, the National Association of Landscape Professionals (NALP) released its official list of the top landscape trends anticipated to receive increased interest and adoption by homeowners this coming season. The association foresees an uptick in landscape enjoyment and projects this fall, due in part to forecasts that predict a warmer-than-usual season in most parts of the country. 1. Technologically advanced fire features. Fire features continue to be a top homeowner request, and during the fall in particular, fire pits and fireplaces are in high demand. In keeping with the home automation trend, today’s fire features offer advanced technological capabilities, with the ability to be programmed to turn on/off at particular times or to be controlled from the indoors or with a smartphone. The automation trend also extends to irrigation systems, which is especially useful during the typically wetter fall season, to prevent excess watering of lawns and landscapes. 2. Contemporary twists on classic fall plantings. Flowers, shrubs and trees that highlight the rich, warm colors of the season and reach their peak blooming time in the fall and winter months—such as chrysanthemums, boxwood and maples—are hallmarks of fall landscapes. Several classic plantings are also now engineered to be more hardy and longer-lasting. This season, expect to see the classics married with modern-day style, with plants arranged in contemporary groupings and landscape designs reflecting clean lines and simple sophistication. 3. Increased focus on lighting up landscapes for safety. While developing landscapes so they can be safely enjoyed is always a top priority for landscape professionals, more and more design elements of landscapes, such as LED lighting, prioritize safety. Not limited to lighting, the emphasis on safety also plays a role in fall landscape maintenance, when it’s important to preemptively evaluate and manage tree branches or overgrown roots that could become a property hazard. 5. Stunning interiorscapes. During the fall and winter months, “interiorscapes,” or indoor landscapes, become more prevalent as homeowners seek to bring the outdoors in. No longer limited to basic houseplants, large living green walls, made entirely of greenery and other plants, create dramatic focal points in interior rooms and courtyards, while tropical container gardens, such as arrangements of edible citrus trees, bring a taste of the island life to properties in cooler climates. NALP develops its trends reports drawing from the expertise of landscape professionals representing various regions of the U.S. who are at the forefront of outdoor trends.